The perfect gift from Santa, the Buff-bellied Pipit was again on the tidal wrack, between Denhall Lane and Burton Point, the first time it's been seen since Sunday morning. 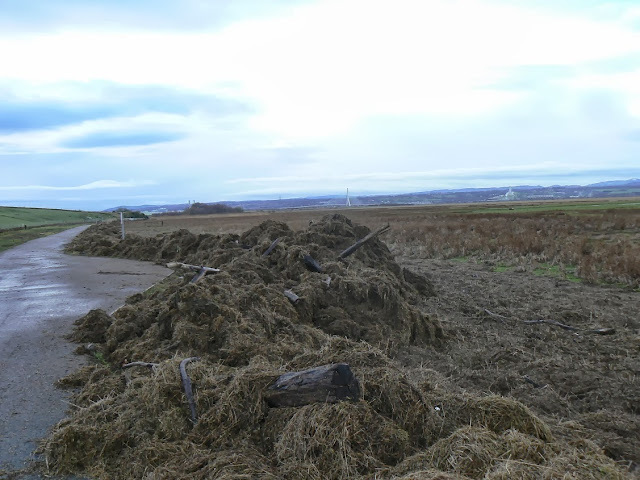 I was surprised how much it stood out once you got your eye in for it, though it was quite difficult to pick up at times, disappearing in amongst all of the debris, and constantly being flushed by dog walkers and cyclists. Eventually at about 09:45 a walker flushed the whole flock and they flew up and scattered and I was unable to relocate the ABBP. I suspected there might be a good chance of relocating it today, because the forecast was for the first decent morning since Sunday. The winds and the rain have been so bad recently to make birding in Denhall Lane very difficult (I know, I was there on Monday!). Also on the tide wrack today, a Northern Wheatear and two Stonechats, whilst on the bramble at the side of the road, Siberian Chiffchaff, Common Chiffchaff and a third bird which looked somewhere in between. Siberian Chiffchaff. Notice the patch of green in the wing making it very reminiscent of Bonnelli's Warbler. Having watched this bird for several minutes, it was quite startling to see the Common Chiffchaff sit alongside it, and see how different they were. 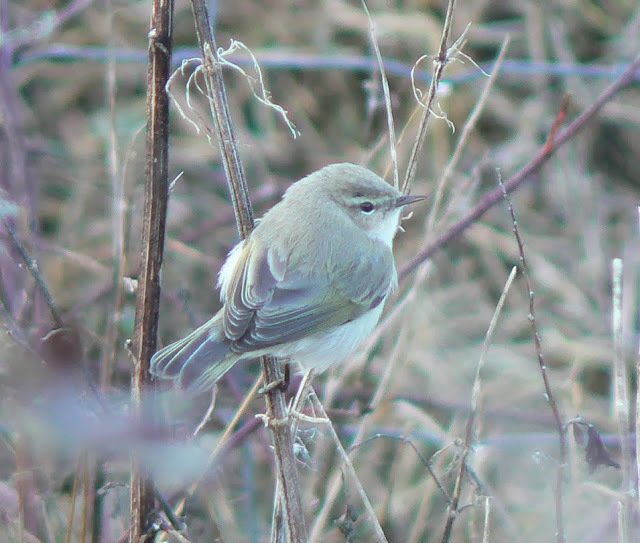 The Common Chiffchaff appeared very brown, with buffish underparts, whereas the sibe appeared almost silvery in comparison. I'm sure that the bird at Middleton earlier in the year wasn't this pale. A cracking bird! The tidal wrack, looking towards Burton Point. Unfortunately this was the only clear shot I got of the Buff-bellied Pipit. I'm sure that you're all convinced by this! Apart from the fact it kept disappearing into the debris of the tidal wrack, it actually stood out quite well when on show, and could be picked up quite easily through binoculars. Unlike the accompanying brown Meadow Pipits, it stood out as being a more grey looking, slightly larger bird. It had a much plainer, greyer back than the Meadow Pipits, though it was obviously faintly streaked when viewed through the telescope. What particularly stood out through the binoculars were the two white wing bars and distinctive facial pattern, with a very distinct supercillium and moustacial stripe. Although in themselves not definitive, this combination of features combined with the overall grey/ brown plumage made it easier to locate when scanning through the Meadow Pipits. Through the telescope the pale lores and complete pale eye ring could be seen clinching the id. It was moving around all of the time, often disappearing and occasionally flushed by walkers or cyclists, so it was difficult enough to get onto with the scope, let alone take good photos with my equipment. I was more concerned with seeing all of the critical features to confirm the id to myself. I think I heard it call a couple of times, though I'm not certain. If it was the bird, it had a harsher, singular "zeet" call, rather than the typical "seet, seet, seet" of Meadow Pipit. 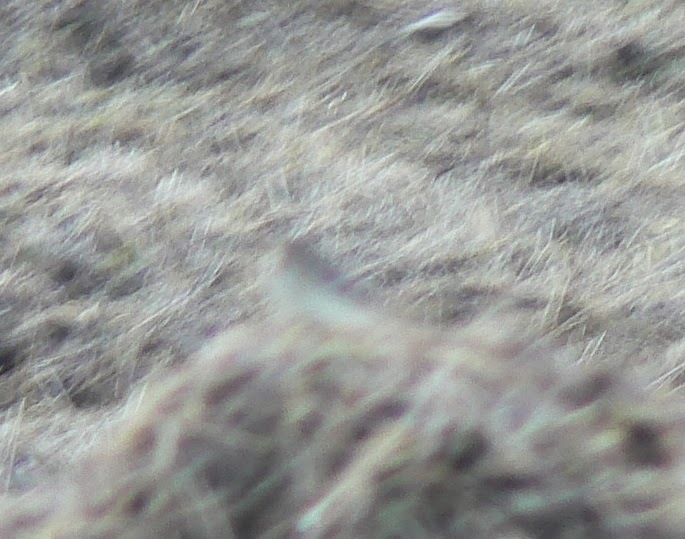 Interestingly, I actually heard the same call when I was there on Monday morning, and saw a larger greyer looking pipit in flight, but couldn't relocate it in the wind and rain.